SARAH'S BLOG OF FUN: Hub Network’s First Annual Halloween Bash And Costume Contest!! 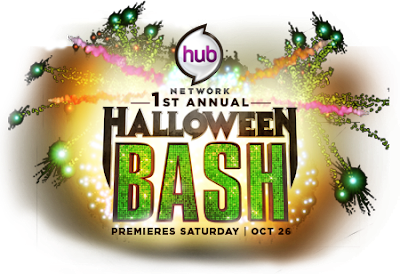 Hub Network’s First Annual Halloween Bash And Costume Contest!! If you are looking for a fun contest to enter to show off your Halloween style, then check out Hub Networks Halloween Bash!! Hurry and enter today. Entries are only being taken until Sunday the 29th!! The special will be hosted by Kenan Thompson (“Saturday Night Live”), along with Halloween expert Martha Stewart panel of celebrity judges. It includes a musical performance from Cody Simpson, presenters Bailee Madison, Rico Rodriguez, Keean Johnson and Todd Newton, and a nationwide costume competition where 50 semi-finalists from each state will head to Los Angeles to be a part of the two-hour star-studded event. The “Hub Network’s First Annual Halloween Bash” costume competition is open to all ages, including individuals or a maximum of five people per group submission. Howl-arious – Shows the lighter side of Halloween with a take on a fun, funny or otherwise hilarious costume. Spook-tacular – Get ready to frighten America by showcasing the most spine-chilling costume for all the ghosts and ghouls out there. Mad Genius – Unique, original, innovative and never seen before. A knight in armor fashioned from bottle caps, bat wings made from old umbrellas, or a cardboard-box jetpack, the possibilities are endless. Display a costume unlike any other — show your Mad Genius. Blast from the Past – Take a stroll down memory lane with a timeless costume. Memories, nostalgia and yesteryear brought to life. Show your take on great figures from before the 20thcentury or a retro 50’s sock hop get up, 60’s flower child or other “period” inspired costumes. Animal Kingdom – Transform into a living creature from the past or present. Be a roaring lion, a school of jellyfish, a firefly, or a Tyrannosaurus Rex. Everyday Stuff – We're looking for the coolest refrigerator/freezer, remote control, mailbox, block of Swiss cheese, telephone and more. Be creative and transform the ordinary into the extra-ordinary. For more information on how to enter, as well as to check out the latest entries, please visit www.hubhalloweenbash.com and also the video at http://www.youtube.com/watch?v=IiSW9L3TUeA&feature=player_embedded.The deadline to enter is Sunday, September 29, 2013. The Hub Network is a multi-platform joint venture between Discovery Communications (NASDAQ: DISCA, DISCB, DISCK) and Hasbro, Inc., (NASDAQ: HAS) with a goal of entertaining, enlightening, empowering and educating children and their families. The cable and satellite television network features original programming as well as content from Discovery's library of award-winning children's educational programming; from Hasbro's rich portfolio of entertainment and educational properties built during the past 90 years; and from leading third-party producers worldwide. The Hub Network’s lineup includes animated and live-action series, as well as specials, game shows, and family-favorite movies. The network extends its content through a robust and engaging online presence at www.hubworld.com. The Hub Network rebranded from Discovery Kids on October 10, 2010, and is available in over 72 million U.S. households. The Hub Network logo and name are trademarks of Hub Television Networks, LLC. All rights reserved.